During my random attempts at cooking, one category that I wanted to accomplish was seafood cooking. I had tried the Steamed Cream Dory in Light Soy Sauce and it was a success so I decided to try another one. I was searching for seafood ideas and found some appetizer recipes featuring seafood. I found a recipe from Alison of Pint Sized Treasures for Crab Rangoon and decided that this was the recipe that I was going to try. I changed up the crab meat and opted to use the crab sticks you can buy at the grocery store but other than that, the recipe stays the same. • 1 box cream cheese (at room temperature) – recommended was 6 oz but I used an 8 oz box, the more cheese for me the better! 1. In a large bowl, beat together cream cheese, garlic, onion, Worcestershire sauce, salt and lemon juice until thoroughly combined. 2. Stir in chopped up crab sticks until mixed completely through. 3. Place a generous serving of the crab mixture on each egg roll wrapper and roll up. Be careful not to put too much to make the egg roll too bloated and ruin the wrapper. This recipe was something I worked and bonded over with my niece, who was my assistant throughout the entire process. She oversaw the mixing together of the cheese mixture and wrapping the cheese into the egg roll. It was good to see her interested in the process and helping because it usually takes a lot for us to get her to help with housework. The entire process was easy to do. My niece and I prepared the egg rolls a few days in advance so that all we had to do on the day was to deep fry the pieces and cut them up for serving. We set everything up and kept the rolls in the freezer until it was time for frying. One thing that you must remember when deep frying something from the freezer is to let it thaw out first before frying. I tried one egg roll straight from the freezer and the cheese mixture was practically melting away before I could thaw it out and get it ready. 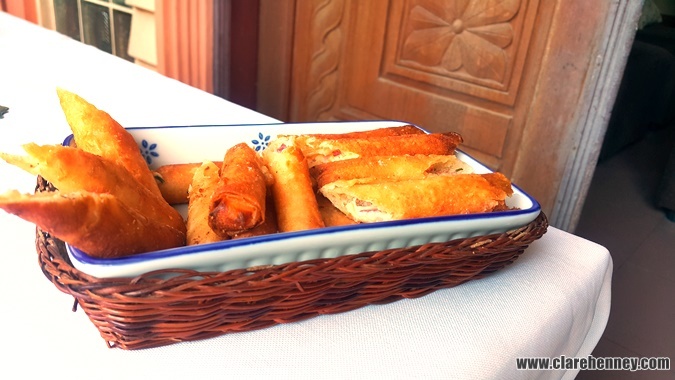 Once we got the rolls down to a reasonably thawed state, frying was easy and the result was a golden-brown egg roll with a warm, melted cheese mixture on the inside. We added some chili sauce for dipping but the egg roll was good enough by itself so we ended up not dipping it into anything. The Crab Rangoon I remember trying a few years ago: it was in a small, triangle shaped wrapper. This version for me is much better because biting into all that cheese is part of the satisfying part of the meal. The small triangle-shaped Rangoon I had before had too small a serving that I didn’t enjoy it as much. This is one of the recipes that I will try again in the future. It’s simple and the ingredients are easy to acquire. I’d probably have to make more next time though because I don’t think we had enough of it the last time. If I could change one more thing about the recipe next time it would be to add more green onion or at some celery to make the filling more colorful and crispy. I’m not sure if that will work but I’d love to give it a try. Bellevue Alabang -- I Want to Go Back!